Blancanieves (Director: Pablo Berger): Eight years in development, Pablo Berger’s sumptuous black and white silent retelling of the Snow White story was almost derailed when he heard about the release of Michel Hazanavicius’ The Artist. Just a week away from shooting, Berger was alarmed that someone else had beaten him to the punch. Luckily, The Artist went on to much commercial and critical success, even winning the Oscar® for Best Picture at the most recent Academy Awards. The director is hoping that the success of The Artist means that, as he puts it, “there is a space for a black and white, silent film” in the market and in the hearts of modern audiences. He’s not the only one hoping. 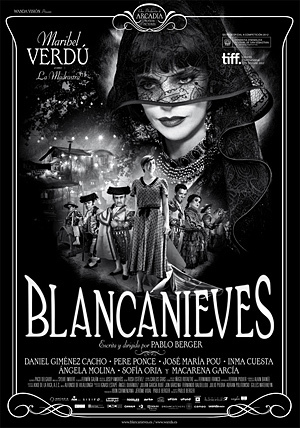 Blancanieves is a visually ravishing melodrama that aims to move and not just to amuse its audience. Our story begins in 1910. Famous matador Antonio Villalta is gored badly in the ring, sending his pregnant wife Carmen into premature labour with their first child. Though Antonio survives his injuries, he’s left paralyzed from the neck down. Worse, Carmen delivers a healthy daughter but dies in childbirth. Grief-stricken, Antonio rejects his daughter, leaving her to be raised by her grandmother. Seeing an opportunity to enrich herself, one of Antonio’s nurses sets her sights on his fortune, and has soon become his wife. Years later, having never met her father, young Carmencita is orphaned a second time when her grandmother passes away. Stepmother Encarna reluctantly agrees to take her in, but banishes her to a rat-filled cellar and forbids her from the second floor of the house where, she suspects, her wheelchair-bound father is kept. Young Carmencita soon discovers that her father is being horribly neglected by his new wife, who prefers to carry on with her chauffeur. She begins visiting him and learning the tricks of the bullfighting trade, but before long, the pair are discovered and Carmencita is banished again, with threats to her father’s life should she disobey. Now grown into adolescence, Carmen is shocked one day to be notified her father has been found dead at the bottom of the stairs. Consolidating her gains, stepmother Encarna arranges for the chauffeur to get rid of Carmen the very next day. After strangling and leaving her for dead in a distant river, he returns to Encarna to begin their new life together as owners of all of Antonio’s wealth. But Carmen is revived and nursed back to health by a traveling troupe of bullfighting dwarves(!). Although she seems to have lost her memory and forgotten even her name, she is soon a part of the gang after she displays some of her skills in the bullring. Word of her fame spreads and soon the group is touring as “Blancanieves y los siete enanos” (despite the fact that there are only six dwarves). As her fame grows, Blancanieves comes to the attention of her stepmother, and their paths are destined to cross again. Making the inevitable comparisons to The Artist, I’d say that Berger’s film is more daring visually as well as more sensual. There is a rich pageantry and theatricality inherent in bullfighting, as well as the flamenco dancing that was the love of Carmencita’s mother’s life. The variety of musical styles along with the use of different rhythms of film editing make Blancanieves a more formally daring film than The Artist. Berger’s influences are the masters of silent filmmaking from its latter, more developed stage: Gance, Murnau. In the post-screening Q&A, he said that he felt that filmmaking took a huge step backward with the introduction of sound. The heavy sound cameras couldn’t be moved and so shots became much more static. Although the film is most definitely an homage to the silent era, Berger admits to using hundreds of visual effects, many to do with the bullfighting scenes. He certainly brings some of the spectacle to life, and while no bulls are actually killed onscreen, there are lots of other casualties in the course of the story. By the time the film reaches its inconclusive but not particulary happy ending, the overall sense of melancholy will persist. Despite the melodrama of the story, I was glad he didn’t opt for the standard fairytale ending, though I suspect others will differ. Fans of The Artist, for starters. Here is the Q&A with director Pablo Berger from after the screening. Very charming indeed. This entry was posted in Film Festivals, TIFF and tagged #tiff12, fairytale, silent, spain. Bookmark the permalink.